I think we would all agree that top reps will and can always make more than their sales managers. But where should that line be? Has anyone seen any data that identifies where manager compensation should be relative to their reps? This is one of those questions that causes a gut reaction. I’m sure you’d agree that a “top rep” should outearn their direct manager. But how many top reps? Is true for every #1 rep in every group? Beyond making for fantastic cocktail party conversation, this is an important question. As anyone with a pulse and open AE headcount can tell you, we’re in a highly-competitive market for top talent. If your compensation plan limits, caps, or otherwise blocks AEs from the potential to outearn their boss, something is wrong. I hope you’ll evaluate your own plans as you read through these findings. Number one, exactly 0.0000% of plans have AEs outearning their managers if they miss quota. To outearn, reps must over achieve. Number two, I only know manager on-target earnings, not actual W2. This provides a great starting point, but it assumes the manager earns 100% of variable. No more, no less. I’m not able to factor in manager accelerators for overachievement. Q1: For plans without accelerators, how many reps will outearn their managers? Roughly 12% of plans have on-target rep compensation exceeding that of their first line managers. Meaning at 100% of plan, a rep will outearn their boss. I also know that in a given group roughly 67% of reps will hit or exceed quota. At the remaining 88% of companies, at some point of overachievement (in excess of 100% of quota), rep compensation will exceed that of their managers. After a bit of math, I found on average reps needed to achieve 176% of quota to outearn their managers. 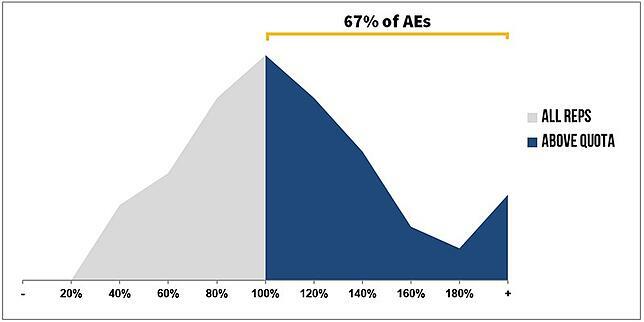 Fewer than one in ten AEs achieve that level of performance. If all I knew about your company was that you didn’t use accelerators, I’d estimate that 15% of reps will outearn their managers. That’s roughly the top three overachieving AEs for a group of twenty. Q2: For plans with accelerators, how many reps will outearn their managers? I had to triple check that last bullet. If a rep is nearly doubling their quota, even factoring in accelerators, roughly one out of four AEs will still earn less than their first-line manager. That’s surprising. An average of 23% of reps outearn their managers under accelerated plans. If I were to ask you: for a group of eight reps, how many should outearn their manager? The top one or two feels about right, no? It turns out that the math (15-23%) backs that up. Take a look at your comp plans and accelerators. 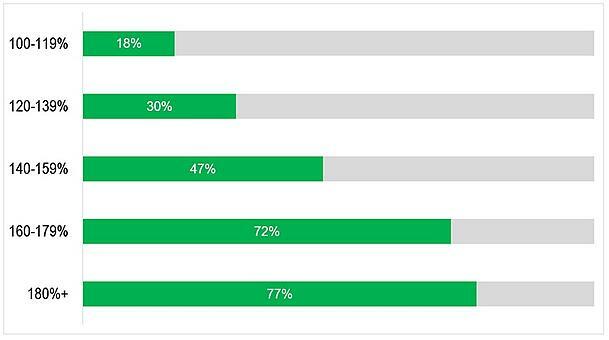 At 125% of plan, would a third of your reps outearn their first-line manager? At 185%, would three out of four? Plans that rely on accelerators, decelerators, and cliffs are now the norm for SaaS companies. Hopefully this will give you guidance on where your plan sits on the competitiveness meter. Get the latest sales development and inside sales insights in your inbox. We're committed to protecting and respecting your privacy. to provide you the content requested.